Early signs of stress in the balance sheet due to high debt and cash flow challenges. L&T is a professionally run Indian conglomerate with focus on Engineering & Construction. The consolidated turnover is Rs. 65,000 crores and Profits 4,700 cr (FY12). Institutions like Mutual Funds, Banks, FIIs and Insurance companies hold 53% stake, with no promoter in sight. The business areas are Engineering & Construction Projects, Infrastructure, Manufacturing, IT and Financial Services. The leader is AM Naik who is the Exec. Chairman. It has about 45,000 employees. International business may be contributing over 25% of revenues. The share reached its all time high of 2163 in Nov’07, and even today 5 years later is 32% below this. It also fell to a low of 379 in Mar’09, before recovering. See Fig 2. The share price has appreciated 42% CAGR over 10 years, making it a top wealth generator. The share is a volatile large cap, and Reuters estimates the Beta as 1.48. The Consolidated Revenues, EBITDA and PAT have gained by 22%, 31% and 20% CAGR over 5 years. EBITDA margin is near the peak of 20%, but PAT margin at 7.2% is below the 12.2% peak. P/E has thus moved in a wide range of 15-30 times, and today is at 22 times. Fig 4. 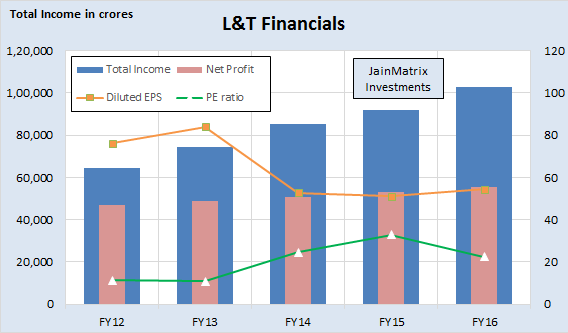 At this level, L&T looks cheap and just below historical average PE level of 22.5 times. Dividend has continually increased, and today’s 825% at FV Rs 2 gives a dividend yield of 1.1%. 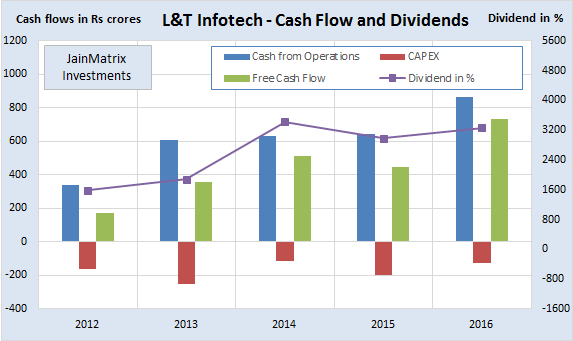 Consolidated Total Debt and Cash Flow data are analyzed in Fig 5. The total debt of L&T has grown faster than Revenues in the last 5 years. While there are a number of new projects, and revenues have grown, but these are soaking up cash, due to Public-Private type projects, or longer payment cycles, or higher working capital requirements. While Free Cash Flow is negative in FY12, when seen in proportion to Revenues, it is not too high. The DE ratio is at 1.74, below the danger level of 2.0 for such companies. The standalone firm has an order book of 1,45,723 cr. 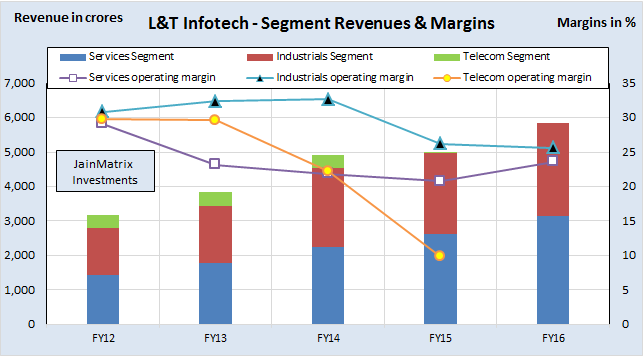 in FY12, so L&T has a Booked to Billing ratio of 2.7 times. This is a healthy ratio among EPC firms. L&T has a very wide portfolio extending from Building Construction, Roads, Oil and Gas, Power, Infrastructure, Switchgear, Defense, Fertilizer, Ship Building, Water and Railways. In addition it has operations in India and abroad. 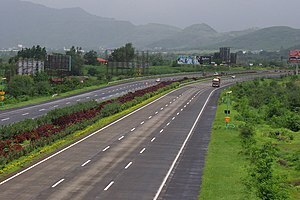 In India, the growth areas have been Metro construction in cities, the new dedicated Freight corridor, Oil and Gas projects, Roads, Power Gen. and transmission, etc. L&T is able to react to growth opportunities and sectors and focus on these. The FY13 focus has been on international business, which has grown better than domestic. This is in the form of new regional teams. There have also been a number of new technical partnerships. L&T enjoys an excellent reputation as a professional and technically strong team. L&T has also worked on internal improvements like streamlining the structure, Vertical focus, spin-off of noncore businesses and investment into growth areas. These are bearing fruit. L&T sees value in listing arms and selling JV stakes, as part of its strategic plan, called Lakshya. L&T Finance was listed in 2011, and is today a fast growing diversified NBFC with a 15,000 crore mkt cap that is 83% owned by L&T. 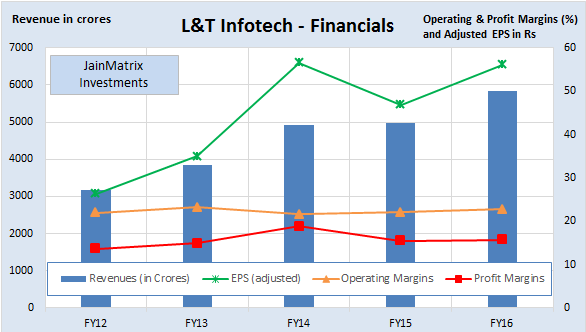 Another listing prospect is L&T Infotech. L&T with its EPC capabilities is a play on the Industrial growth and capacity expansion in India. But the GDP growth has been falling to lows of 6.5% (FY12) and 5.5% (FY13). In terms of infrastructure, there have been problems like high interest rates, govt. clearances, SEB solvency, etc. However, the government is focused on easing the process of infra creation by removing bottlenecks. In terms of GDP, it is expected that the worst is behind us, and there should be a rebound in the future. Interest rates in India are among the highest in the world. While the govt. fights inflation, the rates have affected growth and new projects. But expectations are the rates will reduce in a few quarters. Competition for L&T across businesses is intense, from domestic, MNC firms and Chinese suppliers. The Indian economy is today on a recovery path. There is an urgency in the government reforms, a thrust on infrastructure and an attempt to boost Investments, foreign and Indian. Growth imperatives will push down interest rates, and the capex Investment cycle may sputter back to life. Globally, the Middle East retains its attractiveness, the only worry being social and war tensions. Management quality, integrity and stability are big positives. Strategic, structural and financial directions from management have helped L&T ride through the bad phases in the Indian economy. A turn for the positive in the economy will see the L&T share making big gains. L&T stock is a buy today based on a conviction that the firm has the scale, the diversity and the vertical and geographical width to respond fast to growth opportunities. Advice: Invest for the long term. Price band 51-59 ; Issue period Retail – July 27 – 29, 2011. On the second last day, the IPO has already been subscribed 1.21 times, with breakup of QIB (0.72), HNI (0.5), Retail (2.21), Employees (0.51) and Shareholders (0.96). Retail has the highest oversubscription till now !! This is a new phenomenon. Looks like QIB’s are worried about USA’s debt problems, and a dull Sensex with an Interest Rate increase over last 2 days has affected overall demand. The investment limit for Retail is Rs 2,00,000. If you want to maximise your subscription, bid for 3300 (33X100 lot size) shares at Cut Off for an investment of Rs 1,94,700. L&T Finance Holdings is a high quality NBFC offering. Buy with a 2-3 year investment perspective. L&T FH is the holding company for the financial services business of the L&T Group. L&T FH has four arms that manage the mutual fund, asset financing, infrastructure financing and working capital funding businesses. This includes firms like L&T Infrastructure Finance, L&T Finance, India Infrastructure Developers, L&T Investment Management and L&T Mutual Fund Trustees. L&T FH plans to mobilize Rs 1,245 crore, for a 14.2% dilution (17% total dilution including pre – IPO placement), valuing the firm at Rs 8,700 – 9900 crores. L&T is a proxy for infrastructure, machinery and construction in India. The recent aggression and focus on core competence by management in the last decade has yielded results – of excellent growth and profits. My conclusion is that L&T has rewarded shareholders over the years, grown consistently and transparently, and built a good reputation. And this rubs off very positively on L&T FH. The capital adequacy of L&T Finance and L&T Infrastructure Finance is 16.5 per cent. These high growth rates are expected to continue for many years, as Infrastructure spending in India is on the upswing. The IPO price band is 51-59 per share; Issue period for Retail is July 27-29, 2011. Investor categories includes – interestingly – Shareholders, in addition to the usual QIB, NII (HNI), Retail and Employees. Shareholders can decide if they wish to bid for shares under shareholder quota or Retail/HNI, as multiple bids may be rejected. Retire Rs 345 crore of inter-corporate deposits. The inter-corporate deposit was taken from L&T to support the capital needs of its subsidiaries last fiscal. To support capital adequacy ratio of its subsidiaries. Around Rs 570 crore would go to L&T Finance,and Rs 535 crore would be used for augmenting capital of L&T Infrastructure Finance. All the large Capital Goods and Infrastructure firms worldwide have created finance arms/ tie-ups to bundle their product with financing. This provides a good synergy as the product is capital intensive e.g. GE Capital, Airbus and Boeing financial arms, etc. Invest with a 2-3 year horizon.